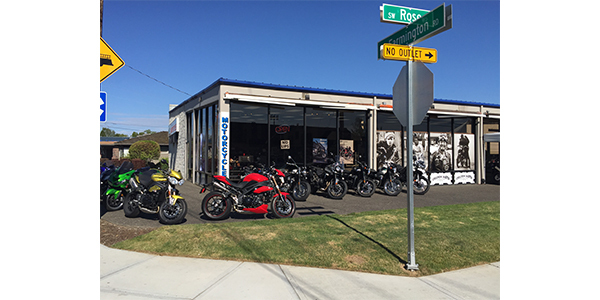 In a world of increasing consolidation and multi-line dealerships, Cascade Moto Classics Inc. in Beaverton, OR, is not only forging its own path as a family-owned, single-line dealership, but is succeeding by following that path. In fact, they are doing so well that owners Kelly and Janice McCarthy will be receiving an award for “Outstanding Contribution to Triumph Motorcycles” at the Triumph Global dealer’s conference, held in London, England. In the mid 1920s, Harley-Davidson started an initiative to organize and design enthusiast clubs that would meet at dealerships. This idea proved popular, and other manufacturers followed suit. A lot of people got through the Depression through the motorcycling community that had formed around their local dealership. In turn, the local motorcyclists supported their dealer. In the 1960s, with increased sales, dealerships started becoming more businesslike. This was overall a good idea, the traditional dealership could be dirty and not particularly welcoming to new customers, but in some cases, the idea of customer service and being a center for the local motorcycling community got lost along the way. The well laid out and sparkling dealership, staffed with enthusiastic, polite service people, encourages new customers to enter. A pot of coffee is always warming in the sales department, enhanced by fresh-baked chocolate chip cookies. The friendly clubhouse feel of the dealership would not be possible without outstanding employees who enjoy coming to work. A great dealership deserves a great website, and Cascades’ online presence is very user-friendly, with easy-to-navigate features, including the well-filled event calendar, a gift certificate offer for veterans and active-duty military, a long list of testimonials and photos of all staff. Unusual items include GPS coordinates (for the dualsport crowd) and a recommendation for a nearby diner. Cascade Moto Classics, by the way, has a five star rating on Yelp — unheard of for a motorcycle dealership. One way new customers find out about the dealership is through motorcycle training classes. Cascade Moto Classics Inc. works with Team Oregon, the local motorcycle training organization. Cascade Moto Classics Inc. got its start as the part-time hobby of the owners. They partnered with a friend to run a parts and accessory business. The business grew, and eventually the friend sold them his share in the enterprise. When Triumph decided to return to the U.S., the McCarthys applied for the franchise, and, after a 7 a.m. meeting with then-CEO of Triumph America, Michael Lock, and Tom Hicks, who was to be the area rep, they were chosen to be the Triumph dealers for their area. 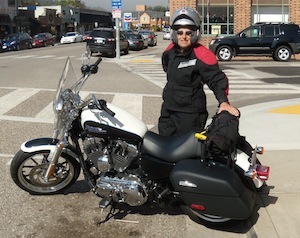 Monahan has been in the motorcycle business for over 30 years and has some advice for dealerships. Cascade Moto Classics Inc. has met that challenge and continues to flourish.